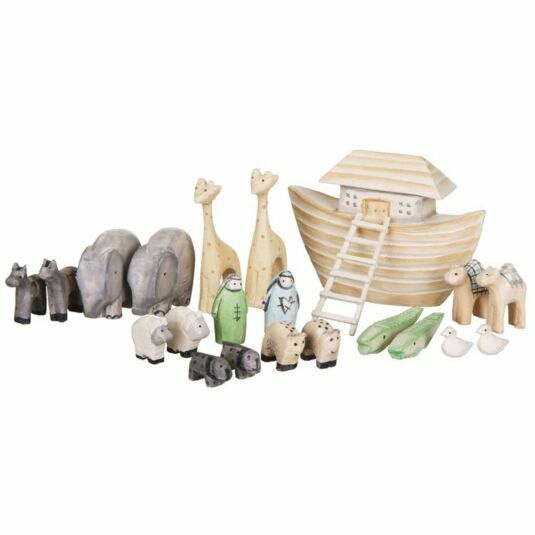 This beautifully crafted boxed set consists of a wooden box containing a miniature Noah’s Ark and the carved animals that go with it. The Ark is painted in mellow cream with ochre accents. It has a deep, curved hull, on top of which sits a little house for a cabin, with carved doors and windows and a steeply pitched roof. A tiny ladder is supplied for access. 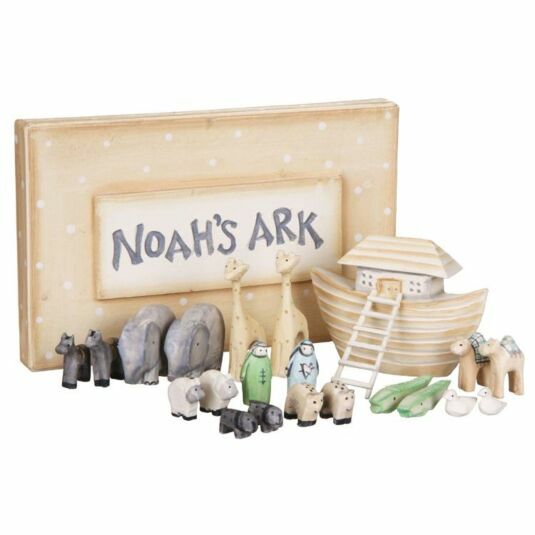 The wooden box which accompanies the ark is painted in matching soft tones of cream and ochre, the lid fits snugly and has a pattern of pale polka dots and a cream-painted plaque, which is carved with the words Noah’s Ark. The lid lifts off to reveal a partitioned interior, containing the Ark, various pairs of animals including elephants, giraffes, crocodiles and cows, and, of course, Noah and his wife. Each item is tiny, the giraffes are only 5.5cm high, the Ark just over 6cm. All the pieces are delicately painted in soft shades of cream, ochre, grey, blue and green.